Buying a car, whether it’s old or new, brings new gadgets to your fingertips. The stereo has a sound that delivers tunes to your ears on drives to and from work. The car seat is typically pushed back or pulled forward for custom comfort. Mirrors and air conditioning vents are placed in just the right spot. However, there’s always room for additional adjustments. 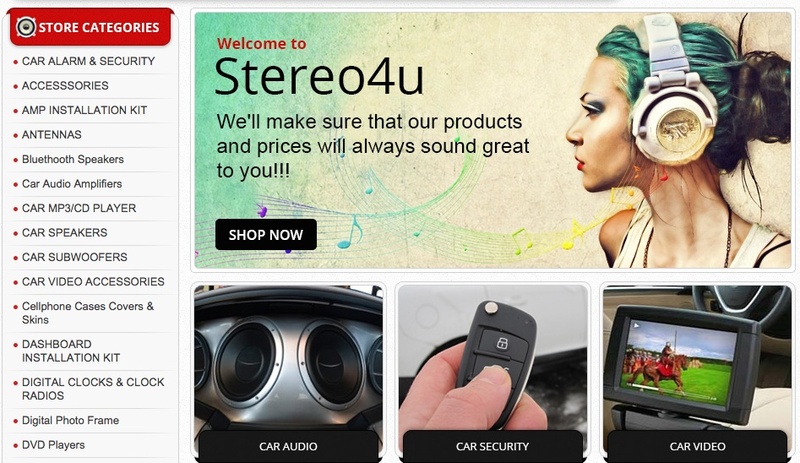 Stereo4U specializes in home and car audio electronics. The shop allows for top quality sound to find its way into the places you find yourself most. The shop recently took on a custom eBay store design by OC Designs Online. After reaching out to the graphic designers and picking one of many eBay templates, the store is boosting the beat in your car while boosting the volume of sales in the shop! The header of this eBay shop design makes the store name and logo impossible to miss. A speaker and cord are both incorporated into the store logo to tie the store name into the customized shop design. Having a bold header builds the brand image for the shop and instantly introduces shoppers to the store. A black and grey information panel reaches across the screen to introduce online shoppers to the main topics at the shop. Customers can read over more information about to store to become better acquainted with the business, review customer feedback and read over commonly asked questions in the FAQs. The midsection of this eBay store design welcomes customers to the shop. An edgy image of a girl wearing head phones while rainbow colored music notes float across the screen lies in the center of the page. Directly to the left is a tab hosting category titles. Shoppers can browse the shop by their area of interest in the section. Below the main image is a section for visuals to meet category titles making it easy to draw customers into viewing more items! The footer of this eBay shop design puts speakers and adapter accessories in the spotlight. Each tab highlights the item with a description, price and option to purchase instantly! The featured items section brings light to whatever items you want disappearing from the shelves. Take a moment to browse our portfolio and request a free quote. You won’t be disappointed. Also, don’t forget to find us on Facebook, follow us on Twitter and check out our Google+ Page too!